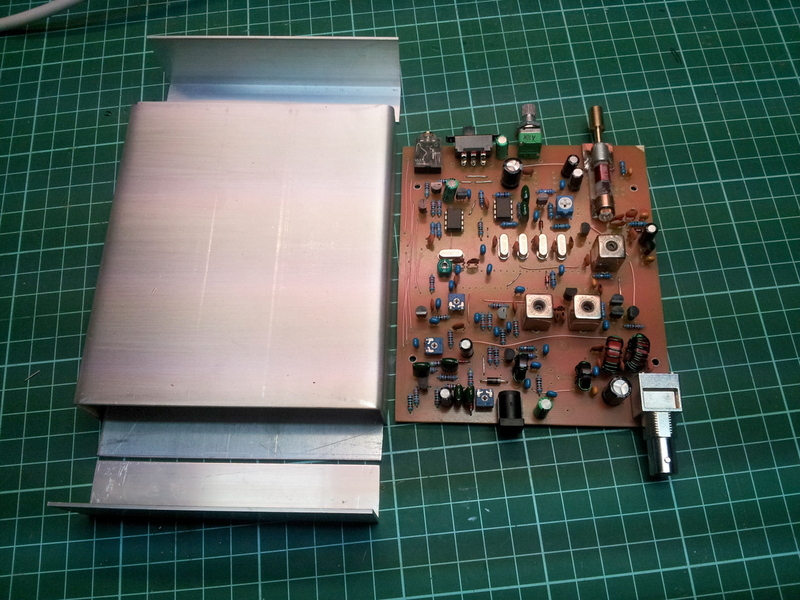 I have been looking around for a compact SSB transceiver design to take on lightweight SOTA expeditions. Something sized around 100mm x 100mm x30mm. If the MST400 was a little smaller, it would be the clear choice, but the board is a little large. An ARRL contest design, the MMR40 by KD1JV looked interesting. I like the lack of relay for TX/RX and use of a CMOS switch on the crystal filter. It also has a CW narrow filter and CW transmit built in. There have been mixed comments on the Permeability Tuned Oscillator (PTO), but I will replace this with DDS, maybe the one from the MST400. Out came the PCB making stuff and after several attempts at getting the toner transfer working properly again, I made a PCB. The printer I use is a HP P1005 and this prints on to Press N Peel film. I used a $16 laminator from Officeworks for the toner transfer stage this time rather than the old iron! The laminator give much more controlled results. Ultrakeet have a tutorial on how to change the temperature of this unit for toner transfer. Components for the MMR40 design are fairly easy to source locally. I was going to put the PTO on for testing, but the long brass screws and matching nylon spacers weren’t too easy to find. 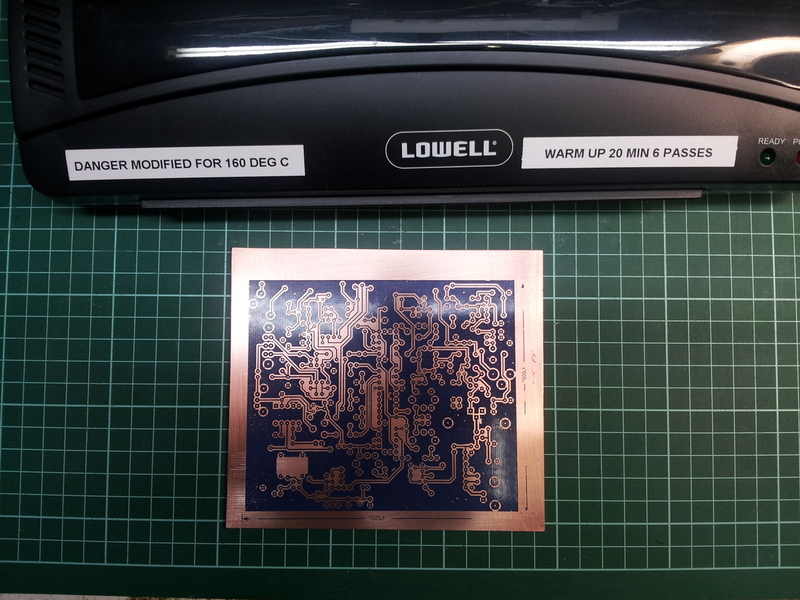 2013-08-14: Have most of the bits now and spent some time the last few nights soldering some to the board. Unfortunately the board is looking a little messy with all the link wires (it is single sided). So far there have been two descrepencies in the documentation. The schematic shows a resistor R12 that does not exist on the pcb layout. I guess this was added later. The pcb layout had R29 and R33 swapped. I found most of the parts from Altronics and a few of the hard to get ones on Ebay this time. 2012-08-19: The PTO coil mounting nuts on the MMR40 original are soldered directly to the copper on the PCB. I didn’t want to solder it to the underside of the board, so made a small separate PCB just for the PTO that fits in the PTO space on the top of the board. This board is held to the main board by two bolts so it can be detached later. 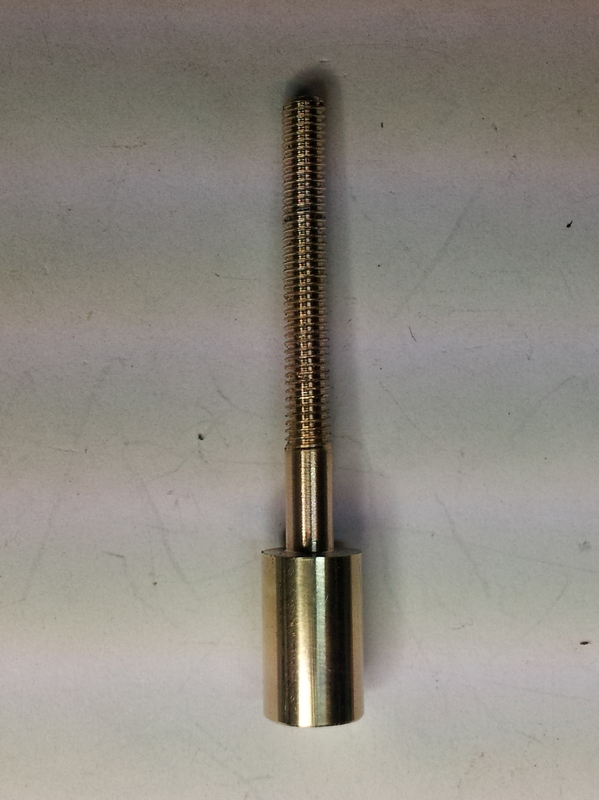 The tuning screw and nylon spacer use M3 threads instead of the UNC thread that the original used. The finer thread should provide better resolution. I didn’t use nuts to mount the tuning thread, brass threaded stand offs where used instead. These have more thread length and might give it better mechanical stability. In any case, the PTO will be replaced later with a DDS, I don’t think the PTO would hold up too well in a back pack. I couldn’t source a long M3 brass bolt for the PTO tuning. My Dad has a lathe and some brass rod, so he turned up a threaded brass length with a stepped 6mm end for a collet knob. It works fairly well, just enough friction when screwed through the brass and into the nylon. Even though the nylon coil former for the PTO is screwed from one end with a nylon screw, I was worried about it rotating if the tuning screw went in too far. As the coil former is hexagonal, a screw head on the underside keeps it locked pressed against the hex flat. The length of the tuning screw thread is such that it should not screw in too far without running out of thread at the front brass threaded standoff. Still awaiting some more components in the post. In the mean time will make a compact housing for the transceiver. I really need a better metal bender. Might be the next project. Bent up a cover for the radio and made a base plate and end plates. Its going to be a tight fit, but the idea is to keep it small. 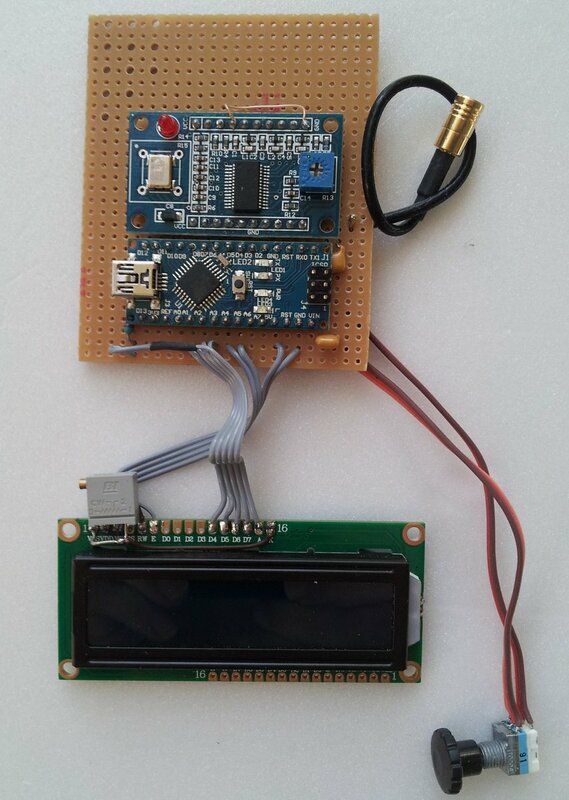 An LCD display will most likely go on the top as I have obtained a very thin module and driver. A DDS board is also on order. I can’t believe how cheap they are on Ebay (~$5.00). It will need a controller of course as well. The PTO tuning is going to be rather vunerable to damage so might have to rethink the large knob. Maybe a low profile 20mm diameter knob will do the job. mechanics. The case looks a little rough so far, but should be fine with some sanding and primer. It weighs in at 350grams so far, a bit heavier than expected, the aluminium is probably a little thicker than it needs to be. Rather than a bent lid, this one is using angle extrusion. As the unit is not very high, I elected to put the display on the top. This way a largish display can be used for better visibility. There was no room on the front anyway. 2013-09-21: Became too impatient waiting for the Ebay NE602 chips, so cannibalised a couple of old commercial radios for the chips. The only problem is that they are SMD, so some microsurgery was needed to adapt them. The receiver sprang to life with no problems. Was listening to a SOTA activation within minutes. The transmitter is a different story, there is something crazy happening with the CW audio oscillator causing it to get into several other stages in the transmit chain and receive audio PA.
2013-09-25: Well, it works. After changing the caps across the transmit driver filter transformers it was peaking properly on 7MHz. As it was, it was peaking at 2x the VFO frequency around 5.8 MHz. Transmit power is a little down, but suspect the low pass filter needs a tweak. The case is painted now and looks great. There is a remaining issue with two FETs, one that mute the audio PA and one that mutes the TX mic. They are getting gate drive as expected but not muting the audio for some reason. Pinouts look OK, maybe the FETs are bad. Should be easy to sort out though. 2013-09-26: Found that there was a PCB ground problem around V1 where an area of PCB groundplane was isolated from earth. The artwork shows the same problem. Once this was linked back to the main groundplane the audio problems went away. It is working on the PTO for the moment, but the DDS will be going in soon. 2013-10-03: The transmitter output was slowly rising from about 0.5 Watt to 2.5 Watts over a period of about 5 seconds after a PTT. If the next PTT was within a second, the power held up, but if the next PTT was a few seconds later, the power would slowly rise again. It took a bit of finding the problem. A 680pF (C52) capacitor in the low pass filter was the culprit. Thanks Mark, N7EKU, for the suggestions on the MMR40 forum. The capacitors around the PA filter (C51, 52, 53) must be good quality COG/NPO types. The original ones were supposed to be NPO ceramics from a local electronics chain and they caused problems. Eventually I tracked down some Kemet COG 200V 680pF caps from Rockby Electronics and used two in series for C51 and C53 (~330pF) and one for C52. R30 was not grounded on the Homebrew PCB. R19 was not grounded on the HB PCB. Pin 4 U4 was not grounded on the HB PCB. R30 and R24 values did not match between circuit and layout. Q12 source was not grounded on the HB PCB. R39 and R37 values did not match between circuit and layout. V1 was not grounded on HB PCB, part of the earth plane was floating. Discrepencies between the HB PCB PTO L2 connections and kit PCB connections. Needed to put in some PCB bridges to connect the ground foil together where it was broken by long tracks or clusters of components to keep PA stable. Next step is to get to work on the DDS, the PTO won’t be to easy to use in the field. Put the MMR40 on an antenna tonight and answered a CQ from a VK7 station, received a 5×9 report! 2012-10-12: Prototyped the DDS using an Arduino Uno as the controller. The Uno is a convenient platform to do the testing, but for the radio it will be using an Arduino Nano due to the small size required. I used a Nano for the controller on the SOTA linear amplifier and it turned out to be fairly quiet RF wise and didn’t cause interference to the radio. 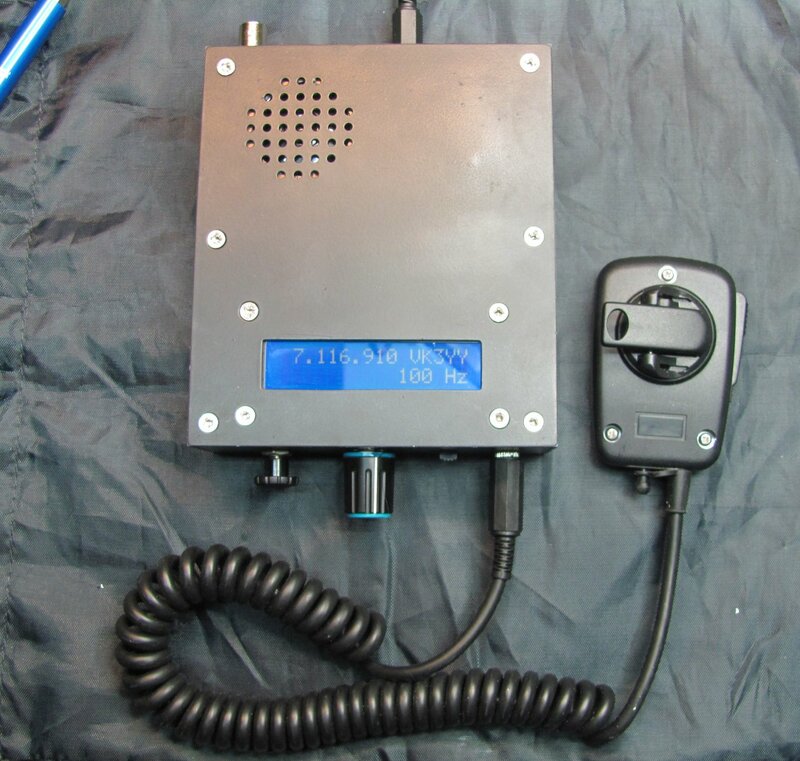 The DDS controller is based on the excellent project from KT1F. 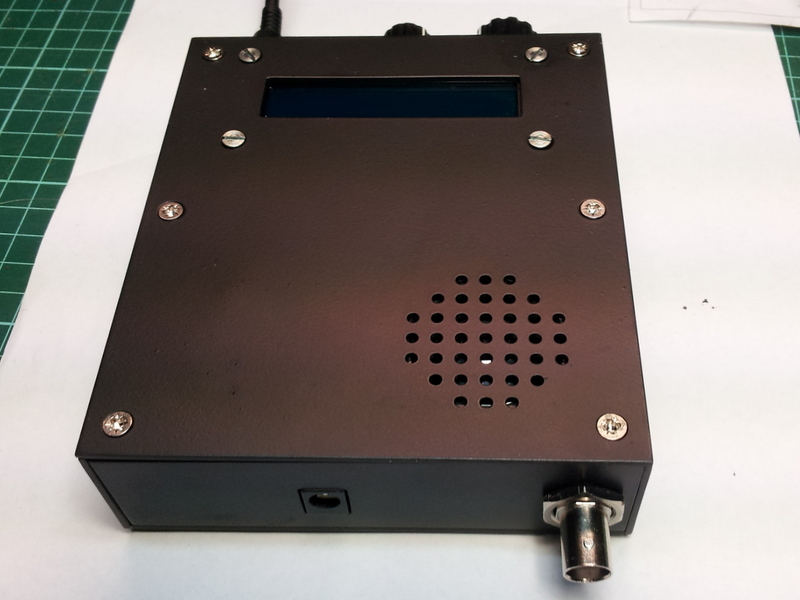 This project was intended for the DDS60 DDS board that uses an Analogue Devices AD9851 DDS chip. I purchased a very cheap DDS board from Ebay that uses an AD9850 chip for around USD5.00 delivered! In a later post, KT1F noted the cheap Ebay DDS chips and posted some suggested changes to work with the AD9850. I tried the changes, but my DDS would not cooperate. A closer look at the datasheet showed a different byte to be written to the DDS after the frequency 3 bytes. I change this from 09H to 00H. I also connected the reset pin of the DDS to the Arduino. After these changes, the DDS sprung into life. The rotary encoder used is a Tocos TP96N00N. This encoder has a push function for changing frequency step. Limits made to the tuning range for 40m. Reversed the direction of tuning on the rotary encoder for the IF offset configuration of the MMR40. Changed the way the rotary encoder was read, as the original code used all transitions on the encoder outputs resulting in four steps per encoder detent. I changed this to only recognise one change per detent. 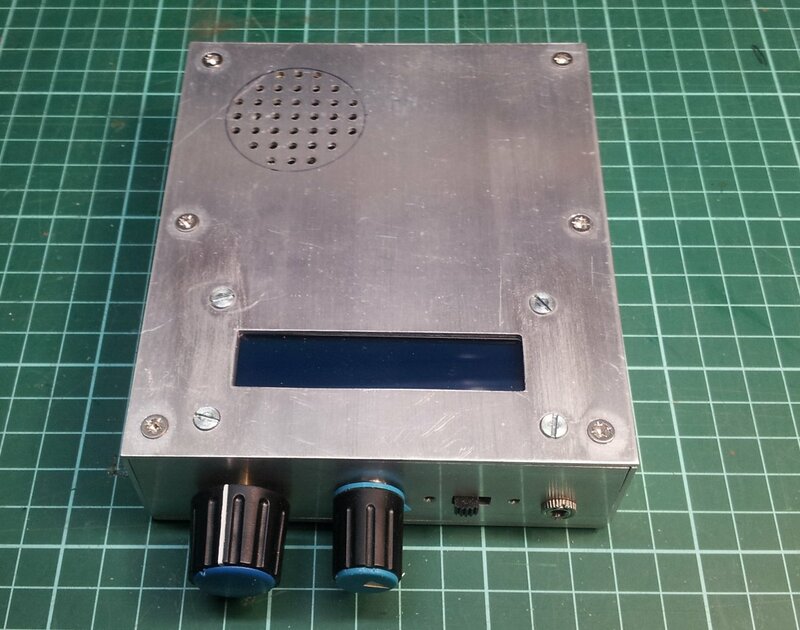 Clock reference made 125MHz for AD9850. I found the March 2013 changes suggested by KT1F for the initialisation of the push button IO where necessary for the buttons to work. The Nano should arrive in the mail soon and the next job will be to make a low profile mother board for the DDS board and the Nano. 2013-10-18: The Nano arrived and was connected to the DDS and display, it all still works. Next step is to come up with a switch mode regulator for the DDS that is clean and does not cause interference to the radio section. Also need to check the DDS and Arduino and RF noise. 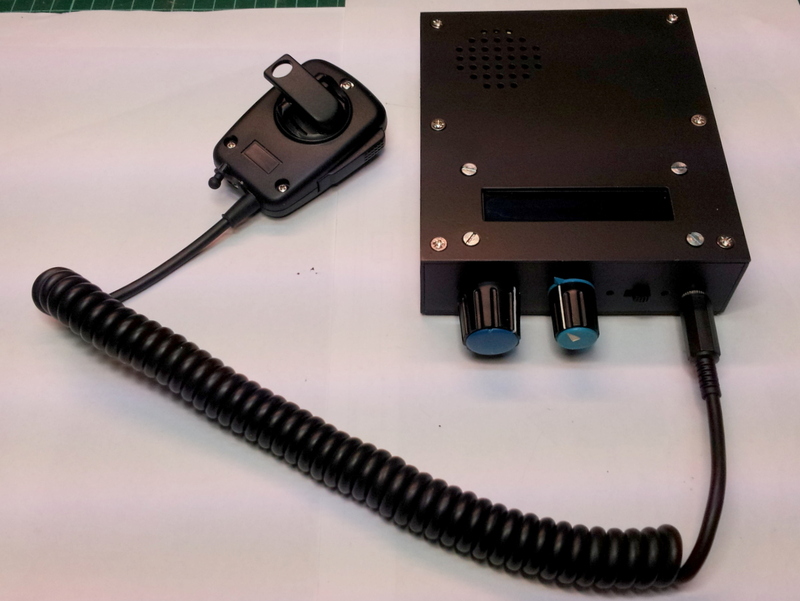 The following photo shows the DDS test bed that fits inside the radio. After it is bedded down and debugged a board will be made. 2013-10-20: Fitted the DDS inside the radio. A couple of issues though. The pot on the DDS board was hitting the top of a coil can underneath, so the whole DDS board was moved 5mm. The next issue was the current drawn by the DDS board. With a linear regulator, the current was around 200mA and the AD9850 chip was getting quite hot. The regulator was getting hot as well dissipating around 1.4 watts. The DDS module spec. sheet stated the supply voltage to be 3.3 or 5 volts. The supply was reduced to 3.3V and the current dropped to around 120mA and the AD9850 felt only a little warm. It seems that the module is 3.3V only. A switch mode regulator was built up and fitted to the prototype board and the radio current at 14V dropped to a total of 85mA, which is acceptable (regulator output at 4.0V). The DDS stopped working at one point and after prodding around, the 125MHz crystal oscillator seemed to be the culprit. 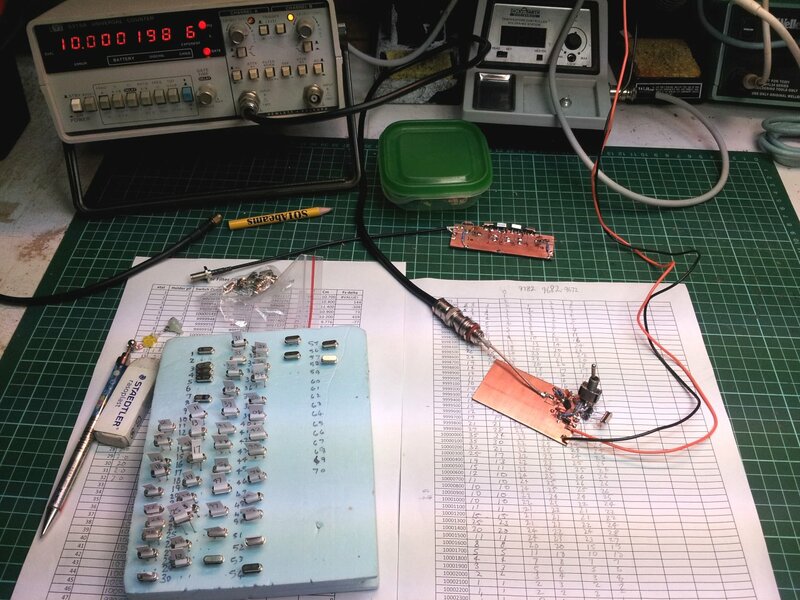 The oscillator was prodded some more and it came completely away from the PCB!. It was carefully resoldered back on the board and the DDS became reliable again. There is a little bit of RF noise from the switching regulator for the DDS although it is pretty low down. The noise can be heard with the volume fully up and the antenna disconnected, in a couple of spots over the band. It is probably OK, but I might experiment with some more filtering before and after the regulator. Both the Arduino and the DDS module are now running from 3.3V, although the display needs 5V. The rotary encoder on the front panel has an integrated push button that allows selection of frequency step from 10Hz to 10kHz. The 1Hz step was removed. A small knob should be fine for back pack operation and be safe from damage. When time permits, I will make a PCB for the DDS / Arduino controller and switching power supply to tidy it up. The whole radio is working quite well now although the main radio PCB looked a lot neater before debugging and fine tuning. 2013-10-27: Eliminated the RF noise from the switching regulator using an 220uH inductor on the DC input side of the regulator. 2013-11-10: Although not getting into the receiver, the supply to the DDS and Nano had 300mV of ripple on it. Increased the output cap to 470uF and ripple down to 100mV. A 1uH inductor in series and a 100uF cap filter should clean it up some more. The display now shows the supply voltage. 2013-11-20: A two tone test shows a bit of IMD that needs cleaning up. It is apparent on the PA driver input, so early in the chain. 2013-12-10: I probably should have left the radio as is, but I had to experiment. I had taken the transceiver on two SOTA activations with good results, but the transmit audio could be better. Thought it would be interesting to have a close look at the SSB generator. Firstly, I needed an accurate frequency source to sweep the crystal ladder filter. 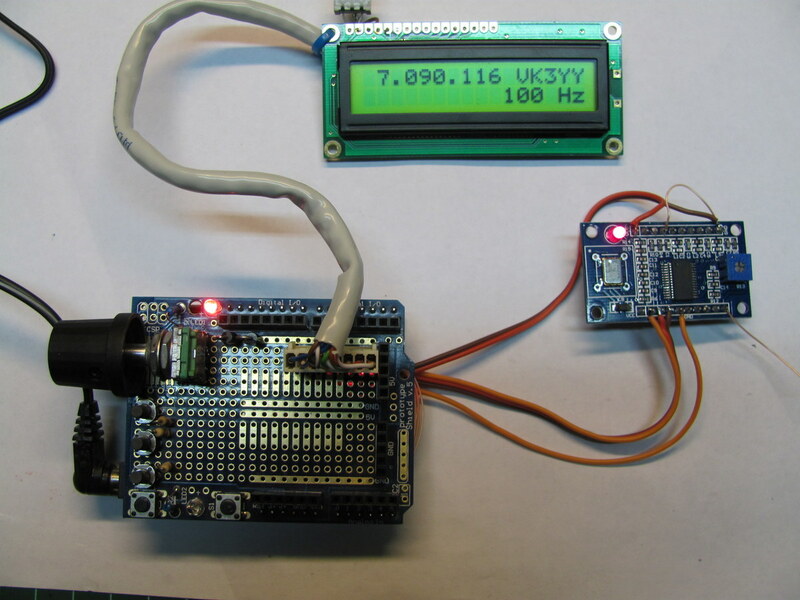 A generator was hastily put together using a DDS module and an Arduino Uno board. The generator was mounted in a box made from PCB soldered together. 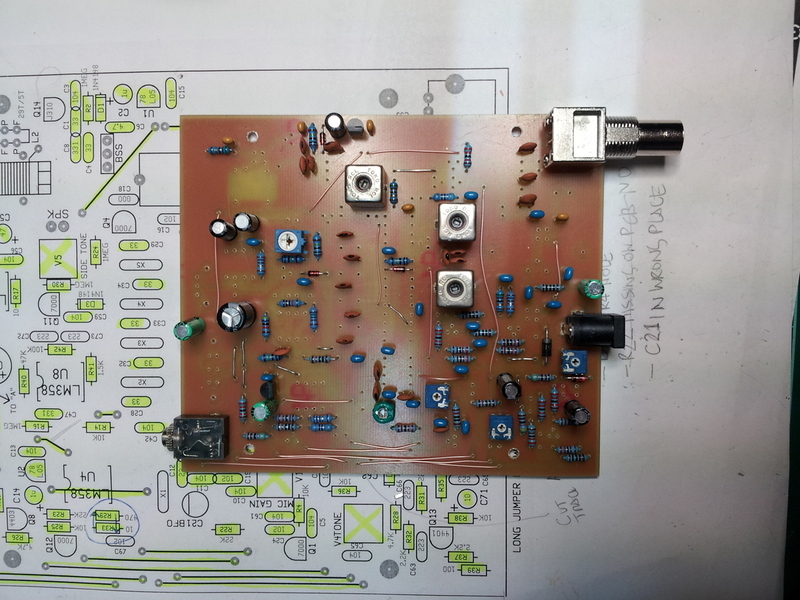 The ladder filter from the radio was temporarily disconnected from the HCMOS switch and terminated with 1500R resistors at either end to simulate the impedance of the NE602 chips. The filter was swept with the generator and the output monitored on a scope. The filter response was pretty lumpy in the passband and quite a bit wider than I thought it would be. The rough 3dB bandwidth (excluding bumps) was 3kHz and ripple in the passband was up to 5dB at the low end. Not so good. The original crystals were not matched, so I ordered 60 crystals from Ebay for $3.50 posted (gotta love Ebay!). The idea was to characterise these crystals and choose matched ones. A crystal oscillator was made with a switch to put a series resistor with the crystal and characterise them using the G3UUR method. A HP5315A frequency counter was used to measure the oscillation frequencies with and without the series capacitor. A capacitance meter measured the crystal capacitance and the oscillator component capacitance that is presented to the crystal. The Dishal filter program was used for the calculation of crystal Lm, Cm and series resonance. After going through all the crystals, there were many sets of 4 that were within a few hertz of each other in series resonance. A matched set was then put in the filter and the frequency sweep repeated. Suprise….. the results were much the same as the unmatched set! It appears that the original filter in the radio is a bit of a compromise to keep things simple. Any attempt to redesign it for tighter bandwidth and less passband ripple lowers the input and output impedance to around 200 Ohms and lower, not a good match for the NE602 chips as they are. As an experiment, I put together a filter with the same capacitor values as the MST400 kit. This filter is terminated in 330 Ohms on either side. This filter is pretty good, not much ripple in the passband and a lot narrower than the MMR40 one. In fact it might be a bit too narrow, the 3dB bandwidth was just 2kHz. The manual for the MST400 says it is 2.5kHz. Anyhow, the MST400 has great audio. Next step was to match a tighter ladder filter to the NE602 mixers. The ladder filter design was created with Dishal for a 2.5kHz bandwidth and 1 dB ripple. I tried an L match using a 20pF cap and 10uH inductor in either side. This should match the 1500 Ohm outside world to the 330 Ohm impedance of the filter. This worked fine although there was a bit more overall attenuation. Impedance matching using a toroid 4:1 bifilar winding on a T40-37 core was also tried. This seemed ok in bandwidth but a bit lossy for some reason. 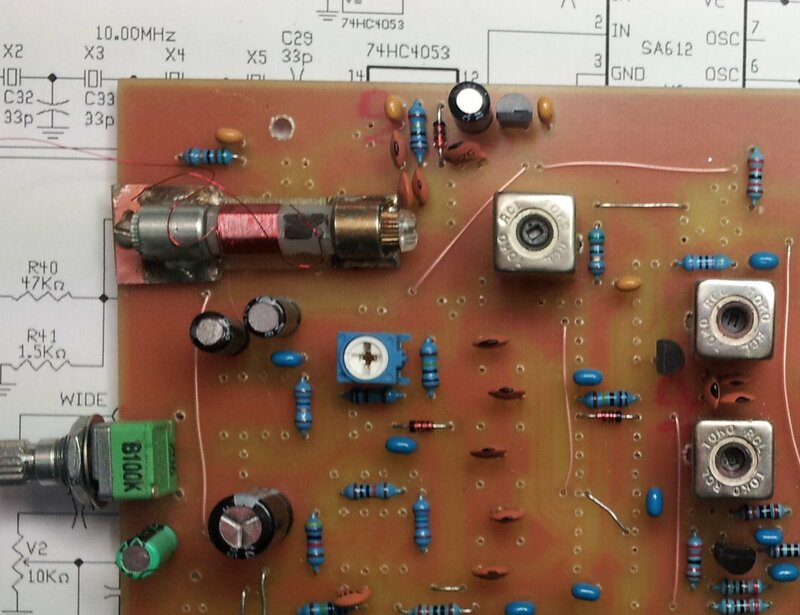 Having a look at the MMR40 circuit around the crystal filter, it is switched for TX and RX using a 74HC4053. This chip has a typical on resistance of 100 ohms, so it is probably not a good idea to switch a low impedance crystal filter with it. I had an idea of trying an emitter follower at the output of the NE602 but at around 200 ohms for the filter, the HC4053 would have a significant loss at 100 ohm switch resistance. The impedance matching will have to be on the filter side. After much simulation and experimenting, the filter in the MMR40 has been replaced. I settled on a filter with 2.5kHz bandwidth and sacrificed a little ripple for a higher impedance of around 400 Ohms. The input and output of the filter have a 510 Ohm termination that is AC coupled to preserve the DC from the 74HC4053 switch. This results in about 390 Ohm in parallel with the 1500 Ohm NE602 input and output. The level is attenuated a bit more than the original filter but it works OK.
Might try an emitter follower on the NE602 output when time permits, but as mentioned previously, the 74HC4053 on resistance is a problem. The BFO had to be lowered in frequency so that the carrier is now around 10,000,600 Hz. Tried an emitter follower without much improvement in level. Also tried an L Match at each side of the filter to match it to the NE602s. 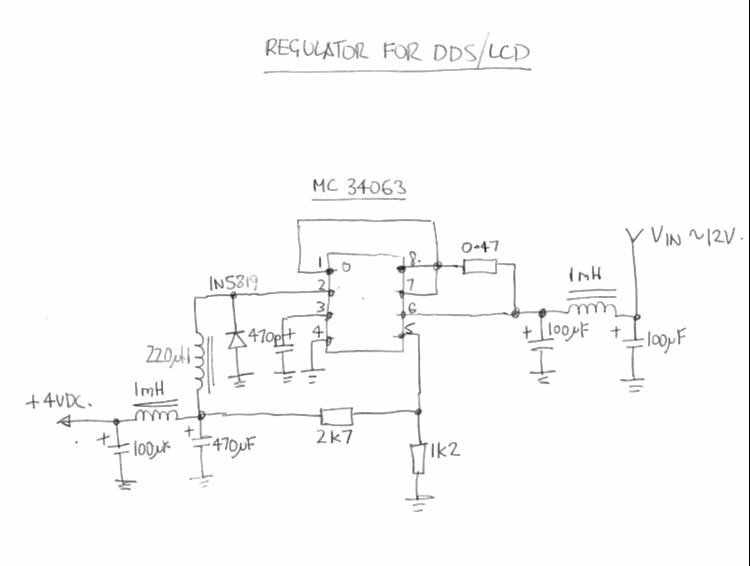 The response seemed OK, but attenuation was same as resistors on input and output. Tried a transformer using an FT37-43 toroid with 4 turns (filter) and 8 turns (NE602). This improved the level about 3dB. It really needs about 10dB more gain in this area. 2013-12-30: I wish I would stop trying to optimise this radio! The receive audio sounded a little on the bassy side so a frequency sweep was set up using an RF signal generator with a scope monitoring the RX audio level. The receiver was tuned in 100 Hz steps so as to produce a sweep of frequencies between 300 Hz and 4 kHz. The plot showed the response drastically dropping off after about 1kHz. 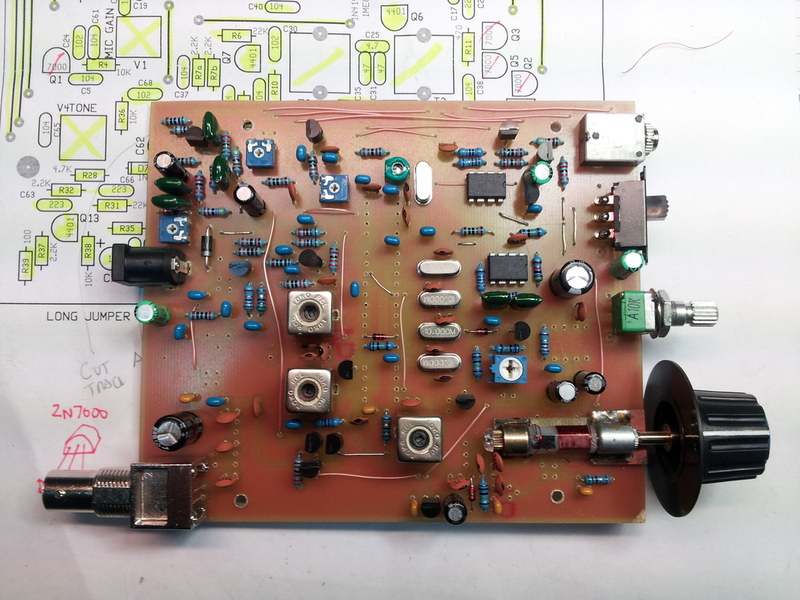 Looking at the schematic, there is an audio amp following the demodulator with a gain of 100 (U8a). This op amp has a 1 meg resistor in the feedback loop setting the gain. Across that resistor is a 330pF capacitor (C47). A 330pF capacitor has a capacitive reactance of 1 meg at only 500Hz. This means that the gain will be halved or 6dB down at only 500Hz. This explains the audio sounding so bassy. The capacitor was removed and the frequency response swept again. This time the response pretty much matched the crystal filter response around 10MHz, so all good. I couldn’t see any HF noise on the op amp output, but might place a 39pF capacitor across the 1 meg resistor just in case. This should keep the audio response good. A 39pF capacitor has a reactance of 1 meg at 4kHz, so this will shift the 6dB point to 4kHz (1 meg resistor and capacitive reactance in parallel). 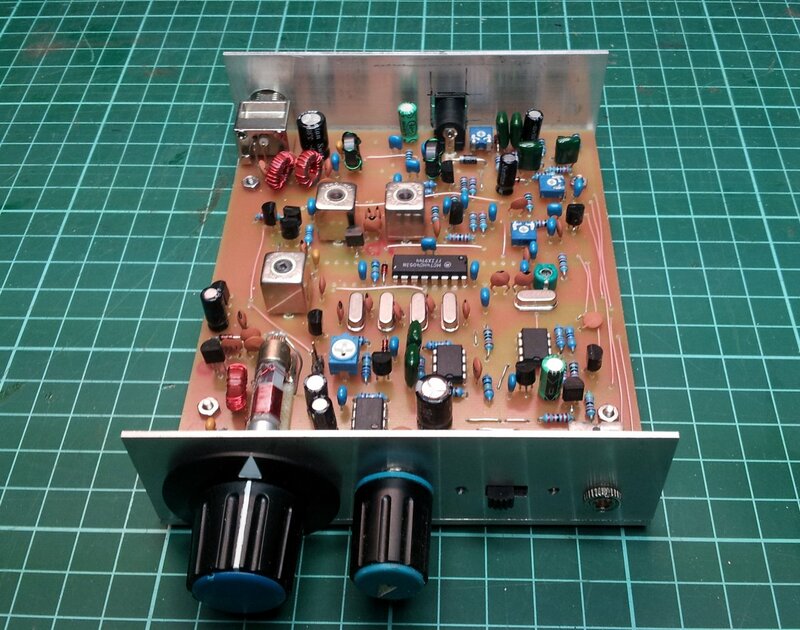 Also see this 40m QRP HB transceiver. 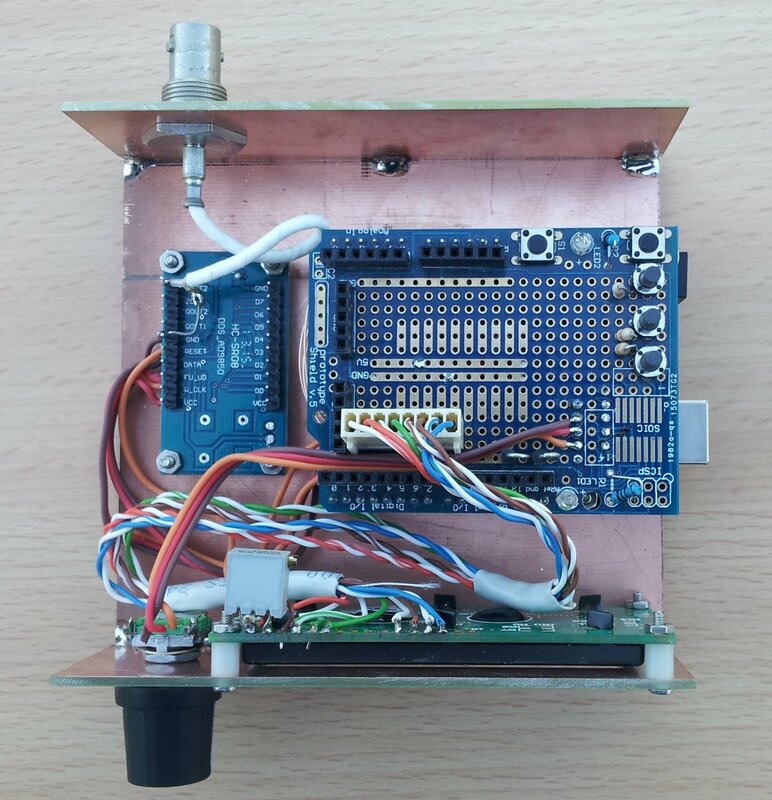 This entry was posted in Projects, radio communications and tagged AD9850, arduino, backpack, backpack radio, DDS, hiking radio, homebrew, MMR40, PTO assembly, qrp, rotary encoder, SOTA. Bookmark the permalink. Hi Juan, send me an email and I will send you the code I am using. Cheers, Glenn. 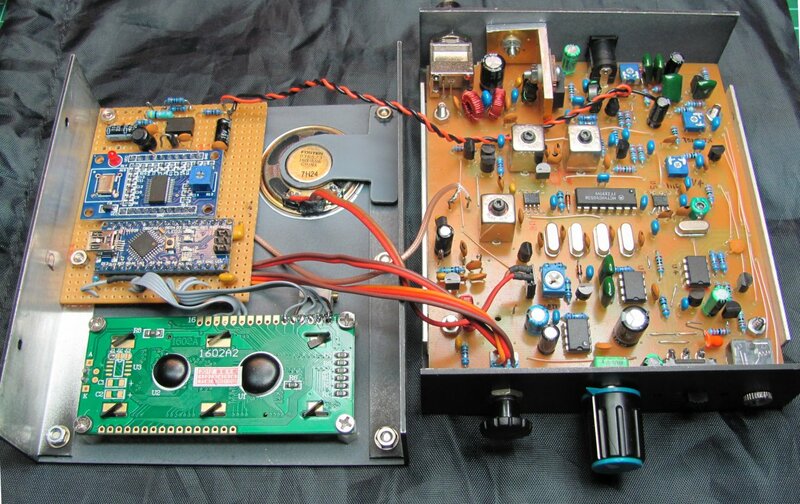 I have read with great interest about your project and I am in the middle of building a QRP rig. I would like to give your VFO design a try. If you still have the Arduino code, could you please email it to me. If you no longer have it, could you point me to some good resources. Thanks a lot, Best of 73’s to you. I can email you the code if you can send me your email address. Hi Peter, the code has been sent. whether the frequency of the DDS output can be set from 0-80 Mhz ? i was confused to make the code for interface controlled..
Could you give me any advice on the display and arduino please? I’ve built many working rigs but know absolutely nothing about programming these things. Amy help would be most welcome. The display is a common 16 char by 2 line hd44780 type. Thank you so much for the info. I will take a look and see if I can unravel the mysteries! I just noticed that there is no schematic of the Arduino Nano, display and DDS. I can post this on the blog if this will help. I’ve bought a qrp dds 0 -10MHz vfo from eBay. Will I be able to simply connect it to the vfo output on the rig (and remove the pto vfo)? If you are interested, I will keep you updated on my build. Thanks for any help…you’re rig looks brilliant! If mine comes close to that quality I’ll be happy. 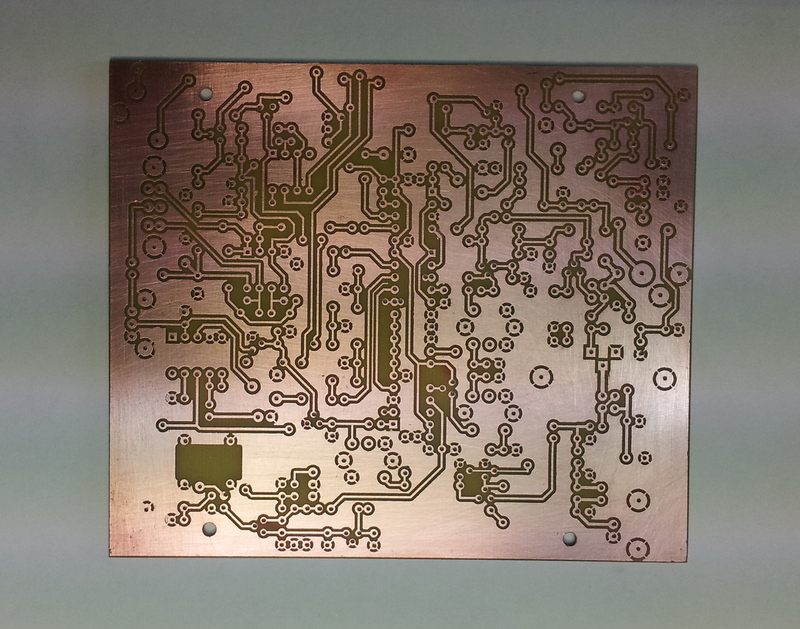 I have made a bigger pcb (6.25″ × 5.25″ double sided fibreglass). My eyes are not as good as they used to be! Thanks, keep us posted on your progress. The DDS output can be injected into U6 via a cap. I added a ground pin and a pin to this point on the board for the DDS coax, I think I lifted a leg of C6 the 4.7pf cap. Every homebrew transceiver is a journey. The story is as much the goal as the end product. Thanks for taking the time to blog it. The ne602 8 or 10Mhz IF superhet is a recurring pattern now in qrp rigs. It started with Drew Diamond’s TCF in the mid 90’s and continues today, with the addition of DDS instead of flaky vfos. Good luck with your rig and long may it be modded! Thanks Paul , it is indeed a journey and a lot learned along the way! It works well now and not planning to take the lid off for a while. Glenn, call me stupid, misguided or foolish, but I have started to collect parts for the DDS vfo. They are all easily found apart from the encoder, the page you refer to is gone. Have found the Bourne encoder mentioned in the original ladder line pages, at Digi key. Will buy one if no others can be found. Did you have any other suggestions? I would prefer to pay a bit more for a better quality piece if possible add it is to become a main tuning control and I don’t want a flimsy plastic shaft snapping of in the backpack! 73 Paul vk3hn. I did purchase an encoder from Altronics, but it didnt have a push function. The Tocos unit is good quality and compact incorporating the push function. Hi again, thanks for posting the circuit of the switch ing regulator you used. I have the circuit for the digital dial based on the DDS 60 module which should provide all I need for the ad9850, arduino and display connections. Will report progress. In the mean time could I ask you to email the sketch to prt459 at gmail dot com please? 73 Paul vk3hn. I have sent the modified DDS 60 software. Will be interested in your progress! Cheers, Glenn. Great page! I am currently struggling through a similar mmr40 and nano controlled dads build. Could you share your code/sketch please?? Hi, some years after the last post here so hope you can help. I noticed you used TOKO coils in the build and wondered if you could pass on winding details please since you have been there, done that.. I just started the build here, home etched PCB and thanks for pointing out the errors in the board! My board is now almost fully loaded and i will probably use Si5351 VFO. Possible change the IF to 11.052MHz as i don’t have any 10mhz xtals. 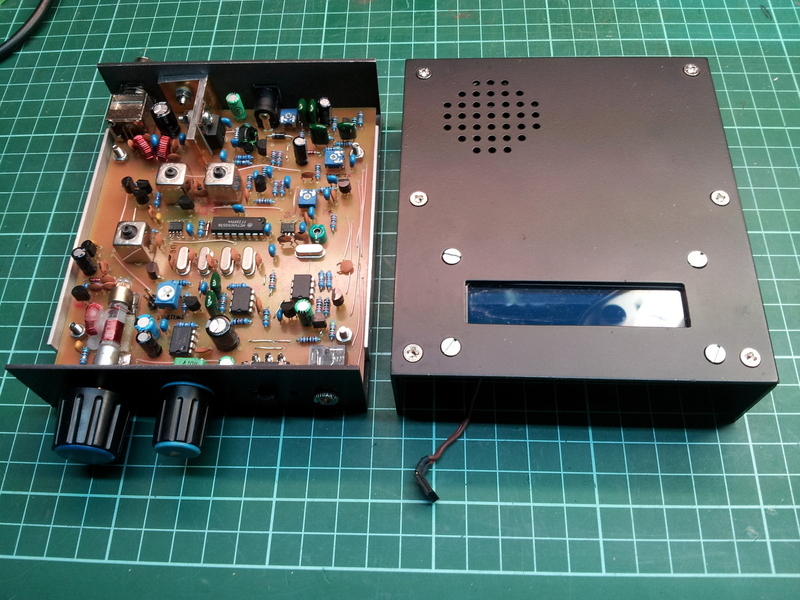 Hi Glenn, its been a while since I worked on this transceiver, and did build a later one using an Si5351 as per the link at the end of the article. I obtained the Toko coils from an ebay seller in Victoria, not sure if he still has any, the seller was Benny International. https://www.ebay.com.au/str/bennyinternationalelectronics He doesn’t appear to stock them now, but it appears that Minikits in South Australia do. They may be ok. The coils were 10MHz IF coils from memory and all they needed was a few pF to bring them down to 7MHz. Cheers,Glenn. Thanks for the fast reply. I have a few TOKO coils i can re-wind so will go with calculating the required “L” from the 47pF used in the BPF i guess. An update on the coils for T1, T2 & T3. I used TOKO 10k formers (AL ~ 16) wound to be approx. 11uH. Used 26 turns with primary 3 turns. The Tx BPF tunes nicely on SA-TG, with BW just a little wider than the 40M band. Loss about 2dB. T1 tunes also with no Cap. fitted, as in the original article.